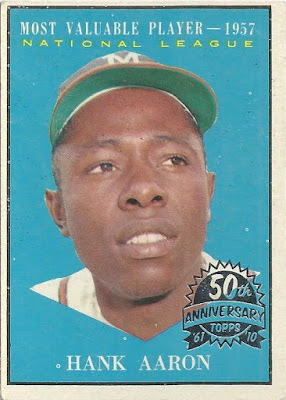 Shoebox Legends: Celebrating 1,000 Buybacks with Hammerin' Hank!!! 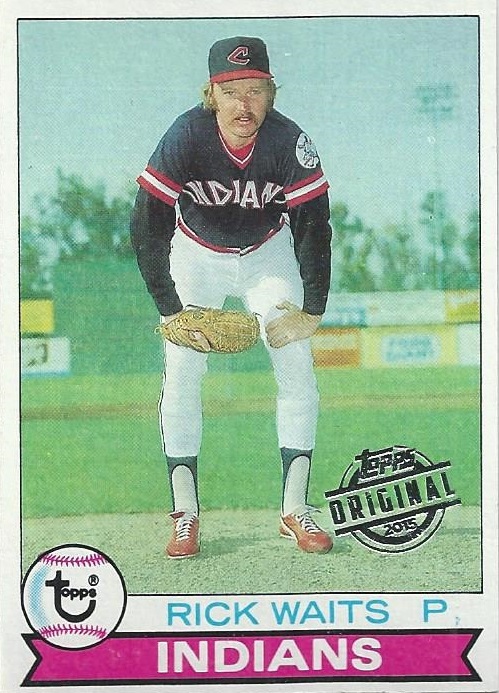 After a couple of years of effort, today at long last I reach a very significant milestone in my buyback franken-set project. After nearly two years of trading, purchasing, scanning, cropping, inventorying, organizing and posting here on the blog, I've reached my 1,000th buyback at last! I could think of no better buyback to celebrate the occasion with than one I acquired only last month, featuring one of the most feared hitters and admired names in the history of the game, the great Hank Aaron! Pretty sweet, huh? What we've got here is Aaron's card from the 1961 Topps MVP subset, paying tribute to his 1957 National League MVP Award. This was stamped and included as a box-topper in the 2010 Topps Heritage set. Finding stars, particularly HOFers like Hank, among these box-topper buybacks is a rarity, especially in the earlier years of the Topps Heritage release like this. 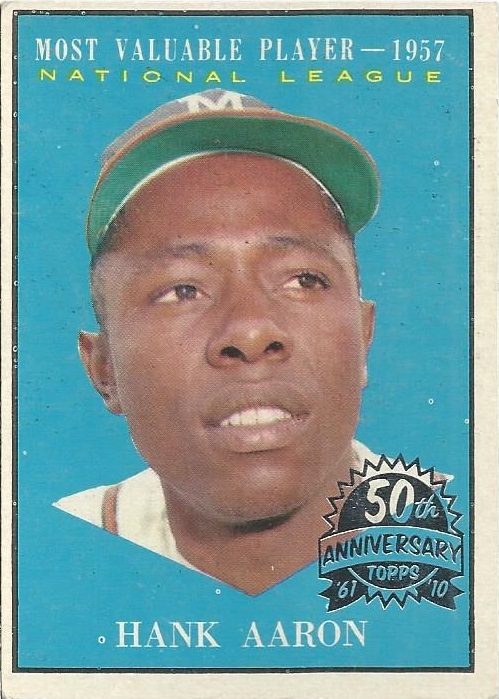 In fact, I'd never seen a Heritage Hank Aaron buyback from any year prior to laying eyes on this one, and who knows if/when I'll see another. That's why, when I saw this one listed on eBay in early February with an opening bid of 99 cents and no reserve, I knew I had to bring it home. In the end, I paid $41.01, and it was worth every penny in my mind. I suppose I could've picked up a pair of 2018 Heritage blasters instead, but there's not a chance I'd have found anything that would bring me half as much joy and long-term satisfaction as this card will. 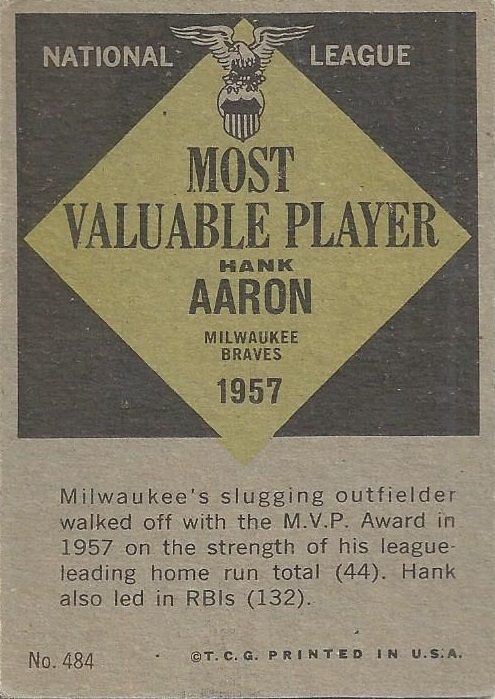 Here's a look at the back, which gives a very brief write-up on Hank's MVP season in 1957 with the Braves. This was the only MVP he'd capture over the course of his impressive career, though he'd finish in the top three in voting six other times. Also, his 132 RBI in '57 would stand as a career-high in the end. This one obviously makes the franken-set, right? ...but I don't think there's a baseball fan on planet Earth that would keep him in there over Hammerin' Hank! Over 3,200 games played, 3,771 hits, 755 home runs, 2,297 RBI, 20+ All-Star selections, two NL batting titles, multiple Gold Gloves, an MVP, a World Series title, enshrinement in Cooperstown and...at long last...a card in my buyback franken-set! It feels great to get to 1,000 total buybacks. A special thanks to all of you who've sent me buybacks in trade, read along through the first couple of years of the project, and left encouraging comments to keep me going. I'm having an absolute blast with this project, and I won't be slowing down anytime soon. Onto the next 1,000, I certainly hope you'll join me for the ride! Total Buybacks in Collection: 1,000! Congrats on 1,000! 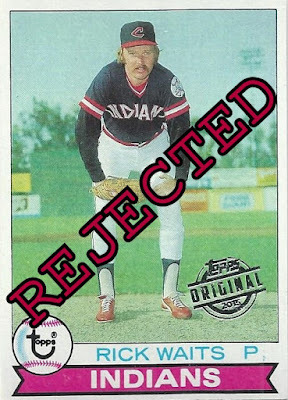 I think I can safely say that's the greatest buyback I've seen on this blog or any other (and Topps even stamped it in a good place!). I would've laid money that a Hank Aaron buyback was never made, but after reading this post, I now see that I would've lost that bet. Deserving of the buildup. Congrats on the milestone! Congrats! I really enjoy your buyback series, even if I have nothing worth saying I try to read them all. Wow, congratulations! Like Nick, I would've laid down money that there weren't buybacks for vintage cards like this, but I guess there was at least one. I wish you continued luck in your quest to complete the FrankenSet! Even though I hadn't seen this one before, I'm not surprised that it exists, as they did stamp at least one Mantle (can't remember the year), as well as a '58 Clemente... which at one time, was on COMC. Great accomplishment Shane. What a way to celebrate 1000 with the Aaron. I thought you might’ve found a Yaz rookie stamped. That's a beaut! Congrats on 1000! Hammering Hank for the win! Congrats on the milestone! Biggety bam! Congratulations on grabbing Hank and reaching #1000. That is a grand card! Poor Rick Waits never had a chance. I'm sorry I missed the festivities; damn internet connection went out the week you were writing these. Congrats on reaching the milestone. Here's to a thousand more!